Definition at line 1516 of file commctrl.h. Definition at line 1517 of file commctrl.h. Referenced by CBandSiteBase::_BuildBandInfo(), AddTextButton(), create_rebar(), CInternetToolbar::LockUnlockToolbars(), CInternetToolbar::OnContextMenu(), OnCreate(), preview_bar_show(), REBAR_CommonSetupBand(), REBAR_DumpBandInfo(), REBAR_GetBandInfoT(), REBAR_InsertBandT(), REBAR_SetBandInfoT(), and set_toolbar_state(). Definition at line 1523 of file commctrl.h. Referenced by CBandSiteBase::_BuildBandInfo(), and REBAR_GetBandInfoT(). Definition at line 1521 of file commctrl.h. Referenced by CBandSiteBase::_BuildBandInfo(), REBAR_CommonSetupBand(), REBAR_DumpBandInfo(), and REBAR_GetBandInfoT(). Definition at line 1520 of file commctrl.h. Definition at line 1528 of file commctrl.h. Referenced by CBandSiteBase::_BuildBandInfo(), AddTextButton(), OnCreate(), preview_bar_show(), REBAR_CommonSetupBand(), REBAR_DumpBandInfo(), and REBAR_GetBandInfoT(). Definition at line 1536 of file commctrl.h. 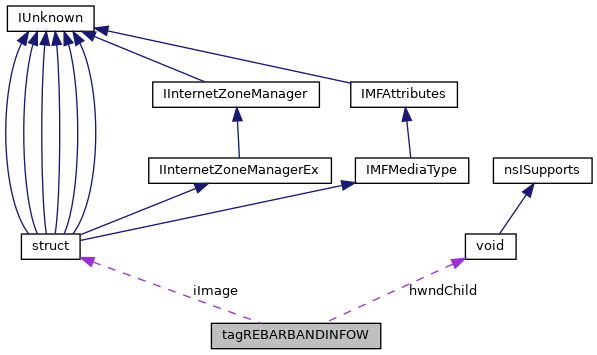 Referenced by REBAR_CommonSetupBand(), REBAR_DumpBandInfo(), and REBAR_GetBandInfoT(). Definition at line 1534 of file commctrl.h. Referenced by CBandSiteBase::_BuildBandInfo(), AddTextButton(), preview_bar_show(), REBAR_CommonSetupBand(), REBAR_DumpBandInfo(), and REBAR_GetBandInfoT(). Definition at line 1526 of file commctrl.h. Referenced by CBandSiteBase::_BuildBandInfo(), AddTextButton(), create_rebar(), OnCreate(), preview_bar_show(), REBAR_CommonSetupBand(), REBAR_DumpBandInfo(), and REBAR_GetBandInfoT(). Definition at line 1531 of file commctrl.h. Definition at line 1533 of file commctrl.h. Definition at line 1532 of file commctrl.h. Definition at line 1527 of file commctrl.h. Definition at line 1518 of file commctrl.h. Referenced by CBandSiteBase::_BuildBandInfo(), CBandSiteBase::_UpdateBand(), CBandSiteBase::AddBand(), AddTextButton(), create_rebar(), CInternetToolbar::LockUnlockToolbars(), CInternetToolbar::OnContextMenu(), OnCreate(), preview_bar_show(), REBAR_CommonSetupBand(), REBAR_DumpBandInfo(), REBAR_GetBandInfoT(), REBAR_InsertBandT(), REBAR_SetBandInfoT(), and set_toolbar_state(). Definition at line 1519 of file commctrl.h. Definition at line 1529 of file commctrl.h. Referenced by REBAR_CommonSetupBand(), and REBAR_GetBandInfoT(). Definition at line 1525 of file commctrl.h. Referenced by CBandSiteBase::_UpdateBand(), CBandSiteBase::AddBand(), AddTextButton(), create_rebar(), OnCreate(), preview_bar_show(), REBAR_CommonSetupBand(), REBAR_DumpBandInfo(), and REBAR_GetBandInfoT(). Definition at line 1524 of file commctrl.h. Definition at line 1535 of file commctrl.h. Definition at line 1522 of file commctrl.h. Referenced by CBandSiteBase::_BuildBandInfo(), REBAR_GetBandInfoT(), REBAR_InsertBandT(), and REBAR_SetBandInfoT(). Definition at line 1530 of file commctrl.h. Referenced by CBandSiteBase::_BuildBandInfo(), CBandSiteBase::_UpdateBand(), CBandSiteBase::AddBand(), AddTextButton(), OnCreate(), preview_bar_show(), REBAR_CommonSetupBand(), REBAR_DumpBandInfo(), and REBAR_GetBandInfoT().